It’s fair to say the Baker goes with me most days, as its simple elegance goes with pretty much any outfit. But there’s more to this brand than just good looks - so we asked Bridget Brown, Filbert’s founder, to explain a bit more about what Filbert is all about. Who is the “we” in Filbert? I don’t think that ethical and luxury are mutually exclusive of each other, and that things can always be made better. This is an underlying premise of Filbert…let’s make a clean, minimalist handbag that is free from branding and logos, that is cruelty-free and made in a factory where the workers are paid fair wages and work in good conditions. I think that we are watching a big change unfold right now and people are starting to question why we consider leather and other animal based products (i.e. dead animal skins) luxurious. Just like with anything, change takes time. But I think that people are now shifting their mindset to think about what really makes a luxury product. Is it the fact that it’s handcrafted by skilled artisans? Is it the thoughtfulness that went into sourcing all of the materials from local and/or eco sources? Is it the fact that the goods are produced in small batches, making it more special and unique? As the founder of a vegan luxe product brand, I assume you are vegan or vegetarian yourself? If so, can you tell us about your vegan journey? What was the spark - what and when did you decide to become vegan and how easy/difficult has it been? What is your own background professionally? Is it linked to fashion, or something entirely unrelated? Have you always lived in San Francisco? I am originally from Mississippi where I attended undergrad at Mississippi University for Women and received a B.A in English and law school where I received a J.D. at Mississippi College School of Law. Upon graduation in 1998, I moved to San Francisco and not long after launched the company Bella Bridesmaid upon seeing a gap in the market for chic, modern and wearable bridesmaid dresses. I franchised the company in 2006, grew it to 43 stores across the U.S. and sold the company in 2012.
Who are your favourite vegan/ethical style icons? I love that Emma Watson created an Instagram page dedicated to her ethical and sustainable fashion choices. Leanne Mail-ly of Vaute Couture is a huge inspiration. She was way ahead of the game in the vegan-fashion realm. If you could offer one piece of advice to people wanting to make more conscious decisions around their wardrobes, what would it be? What are some of the most positive reactions you’ve got from strangers/people in the street/ interactions in general daily life when explaining what Filbert is all about? It’s a thrill when one of my sisters or friends tells me that someone approaches them on the street and asks where their bag is from, and then hear the reaction when they tell them it’s made from vegan leather! 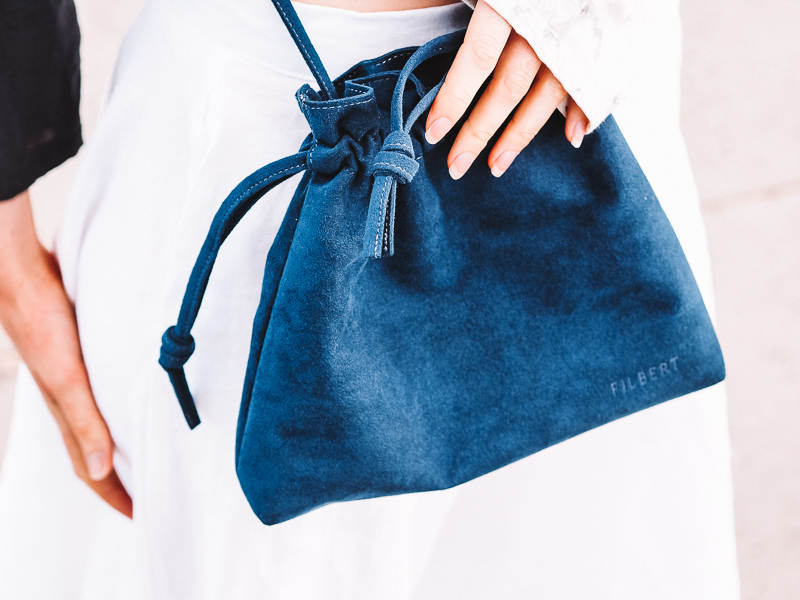 Lyon Indigo drawstring vegan-suede handbag & Baker Pebble cross body bag by Filbert // cruelty-free, made ethically in Mexico. Blue linen jumpsuit & scarf by Not Perfect Linen // transparent, sustainable practices and ethical approach. Handsewn in-house with OEKO-TEX certified European linen. All other clothing by R E M U S E // made in Melbourne, fusing artisan techniques, low-impact dye technology & natural, vegan fibres. GOTS certified organic materials, deconstructed and recycled fabrics.